Front row: Billy Ross, Donald Macleod, George Macleod, Ross Macleod, Justin Calder, Brian Mackenzie. The date is a guess but cannot too far off. Can anyone fill in the gaps? Also, this appears to be a photo for a particular occasion - any ideas? I think this is Willie Blake, Clyde Street. 1st on back row. 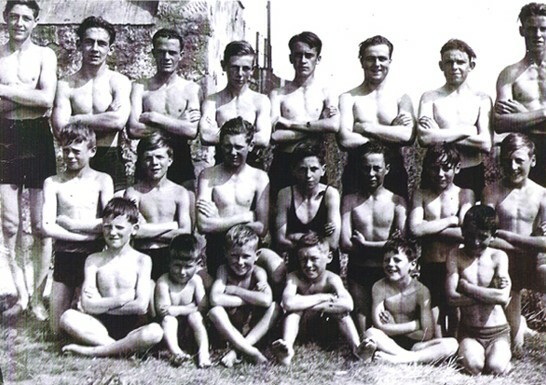 Have spoken to John Ross, in middle row of picture, and he thinks this would have been 1944-1945. Would that be the Davey Matthews that rode a bike everywhere - if it is, bet he still does! Can anyone please confirm if Davie Moir was the brother of Donald, both being the sons of Alexander Moir who was the local carrier? If so are there any known offspring. I know that Donald never married and lived and died in Leicester.